Hong Kong market is now on fire! There are so many good stocks that should be on your watchlist or portfolio. Come and listen to Andy Yew. Which market to participate, China or Hong Kong markets? Singapore Stock Tip: Yang Zi Jiang needs a rest at $1.47! Today a friend ask me to comment on YZJ. This stock after breaking $1.30 has been running ever since. A few months back, we did mention that once it breaks, $1.47 will be our target. Now it is near, and we do think this stock might hit a barrier soon! Time to profit take. It badly needs one rest before any chance of moving up again. When in consolidation, we shall monitor again to see if got chance to break. When buying stock, always buy on stocks that are in consolidation rather than on the run. Singapore Stock Tip: Biosensors heading higher? 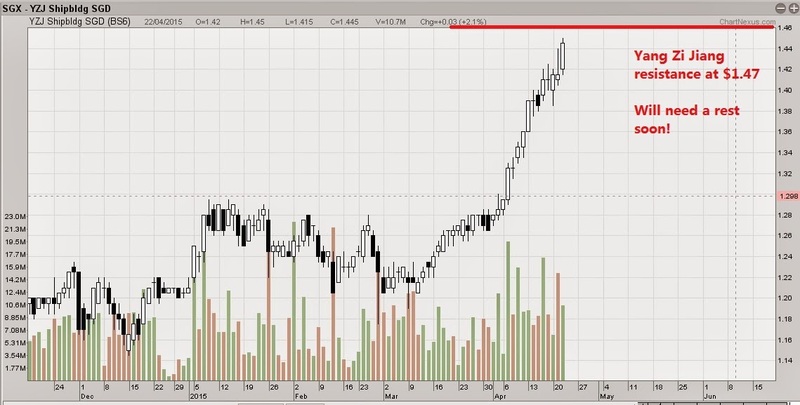 There is a chance that this stock might be heading higher... Let us put inside the watchlist. 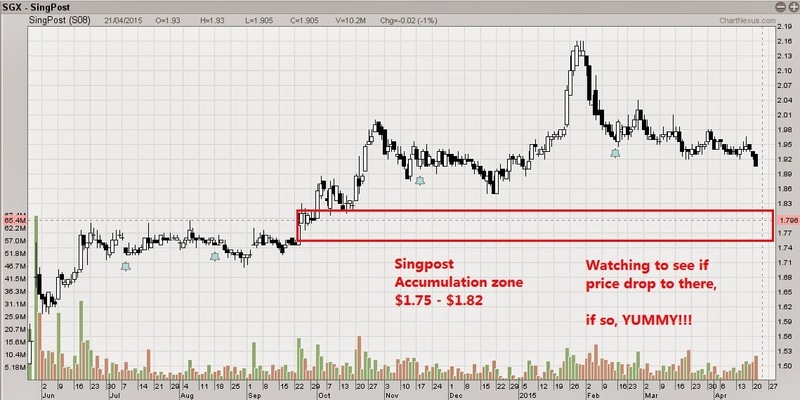 Ever since Singpost reached our long term target of $2 ever since we issued a call to watch when it was $1.30, we have been waiting for this stock to retrace. 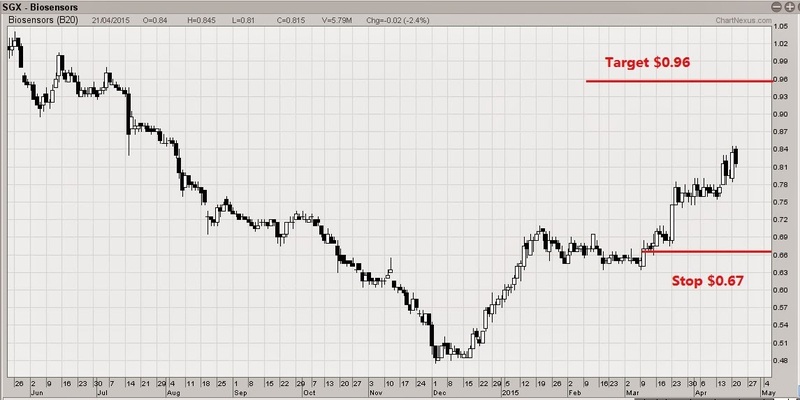 Check out our article to buy on 10th April 2014 when it was still $1.375. To us, this is a fundamentally strong stock and has reached our long term target of $2 last year. Then it went up to $2.16 the recent high. One of our graduates recently asked me where is a good zone to look at this stock again. My reply is $1.75 - $1.82. This is an accumulation zone where if it touched, there is a likelihood of a good rebound. May still have chance to drop a bit more to reach our target. But rest assured that my eyes will be big and I would salivate when it is in this accumulation zone! DOW falls 300 points - DAX falls 300 points - Shanghai A50 futures fall 800 points on Friday! What should you do now?? Has the selldown that we anticipated in April or May started? European stocks dropped sharply today, pulling lower along with other global markets, with traders attributing the moves to changes in Chinese trading rules. Shanghai A50 futures has dropped 800 points within hours of the news of the availability of shorting. Expect a backlash on monday to Shanghai composite! We mentioned about the possibility of a selldown in Shanghai composite when travelled to 3800-4000 region. As a trader or investor, how can you benefit from this drop? Come for our seminar to learn how to profit and strategies your portfolio now!! 1) How to hedge your portfolio from a selldown coming in April or May? 2) How can you make money from a selldown? 3) What is the direction of Shanghai or Hong Kong or Europe indices? 4) Where is the support most likely to be? 5) How can you make money consistently in 2015 from the market? I know that there has been a lot of hype in this stock recently. But my advise is you may want to take some profits off the table in this stock. It has entered into our distribution and selling zone of $0.25 to $0.30. 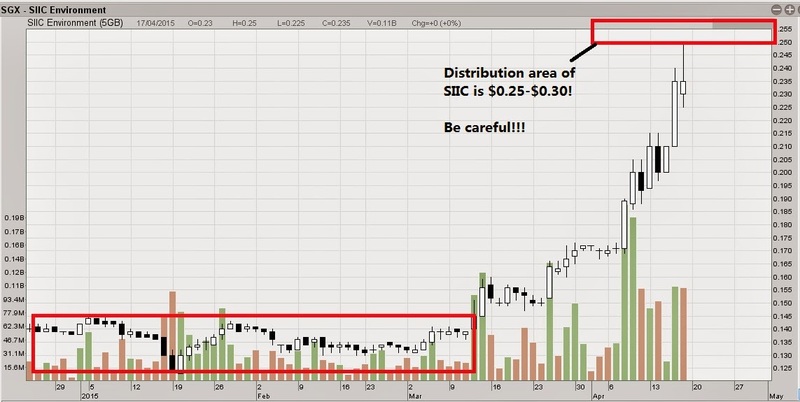 Just be careful of any pullback on SIIC. We received a lot of questions on this stock as we recommended for all to take a look on 28th January. At that time, the stock price is $1.82. We set the second target at $2.09-$2.10. Indeed, it goes to highest $2.14 before it retraces. Now the price is $2.04. Check Wing Tai price chart now. So what do we think about this stock now? For those who want to enter, I would suggest you ONLY enter when you have made your profits! There may be one last burst to this stock. But for those who have not made money, time to zoom in on some other stocks is a wiser choice. What I would do is to put a tight stop loss of $1.95 and a profit target of $2.16. At $2.16, I suggest close all position and wait for a good pullback! One of the most important skills in charting is to identify a stock that has a good breakout. When a stock has a good break, there is always a good chance to make money in a short time. However, sometimes it is not easy as some breakout stocks might fail. If it fails, it might suffer from what chartists called "a fake breakout." Some chartists like to buy stock that has a reversal as prices are cheaper. However some reversals are not real and don't last. If this occurs, chartists term it as a "dead cat bounce". Do you want to know the secrets how to identify stocks that is having a good breakout or a real reversal? Join this seminar with Daniel Loh to find out the secrets!!! 3) Is it important to study chart pattern of a stock before it breaks? 4) Are there any chart patterns that increases the chances of a good breakout?5) How can you make money consistently in 2015 from the market? Find out how you can Screen for Good trending stock in much faster way, which are the stock you should be holding right now! Methods to spot a good trending stocks? How to identify target profit and stop loss? Which Singapore stocks are the strongest now? Which stocks to look at in China or Hong Kong markets? Dear Friends, it sure look exciting these couple of weeks for the pennies! IPC went from $0.172 to end at $0.20 on friday. A few months back it was $0.135. Ellipsiz went from $0.09 to $0.14 in one month. Moya Asia went from an unknown stock from $0.03 to $0.07 in a few weeks. USP group went from $0.04 to $0.07 in 19 trading days. Fuyu also recently jumped up 30% to $0.13 in a matter of weeks. Huan hsin also went from a $0.02 stock to $0.13 in a matter of months!! We noticed that real momentum might be building up in the pennies when the blue chip are already at a high along with the STI index. Perhaps it might be chance for a PENNY REVIVAL??? Join this seminar with Daniel Loh to find out which Penny stocks might be in his watchlist and might be the next IPC or Huan Hsin!!! 1) What the penny stocks that should be in your watchlist? 2) Strategies for April and May? 3) What may be the reason for this penny run? 4) How can you make money consistently in 2015 from the market? Today DOW drop near to 200 points. As of now, 3.35am, DOW has already dropped 181 points. Today drop is because of an economical report called Chicago PMI, a report that studies the enterprises by interviewing the purchasers. It is a reflection on how the enterprises are. Today actual results is 46.3 vs 52.5 forecast. Ouch, a big fall compared to the expectations! 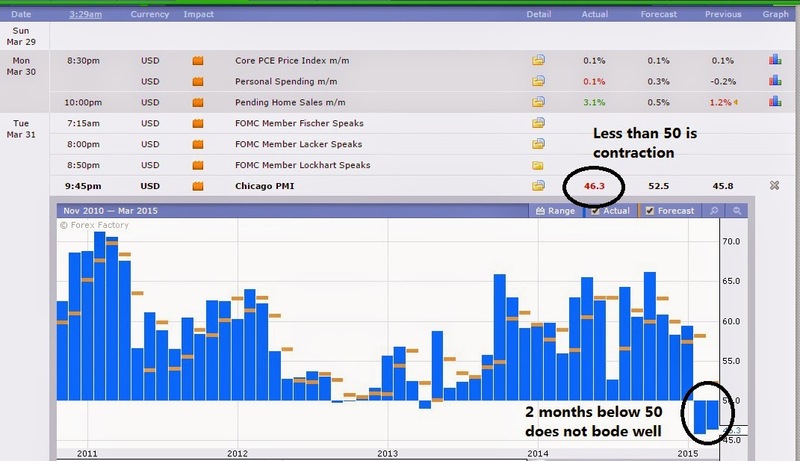 Please note that Chicago PMI has fallen below the 50 figure for 2 consecutive months. Falling below 50 is a sign of contraction. Although this does not mean recession is coming, it means that enterprises are not doing that well this quarter. Of course, some might argue that Chicago PMI is not the official report issued by the government as compared to the ISM, Institute of Supply Management. But I think we should at least be cautious this quarter! If tomorrow's ISM also fall a lot below expectations, expect a backlash! Let us keep a lookout on the ISM report on thursday. It will tell us a lot about the direction of April and May. Shanghai has reached our target of 3800, now it is a deadly cliff! While a lot of investors may celebrate shanghai reaching a new 7 years high of 3800, we think that it might just have reached a deadly cliff. The more it goes up, the more this rubber band effect might cause it to drop hard. 3800-4000 is the distribution resistance zone. Although we still think that this bull run will still continue for a few years, we think it needs a correction badly. We are targeting a 10-15% retracement and a 9 months consolidation. For those who are still holding on to your China shares, it is advisable to do a bit of profit taking. And please do not buy anymore Shanghai A shares or H shares. Some investing friends who invested in China told me that some of the 创业板 a.k.a. technological companies in China has gone up 10-20 times. Let me tell you my opinion, they might suffer from a blumont collapse soon! The more a stock is speculated without fundamental earnings, the more it will fall. Please avoid China shares like a plague now! Will there any market correction coming soon? How to identify market correction? Which Singapore stocks are the weakest to avoid?